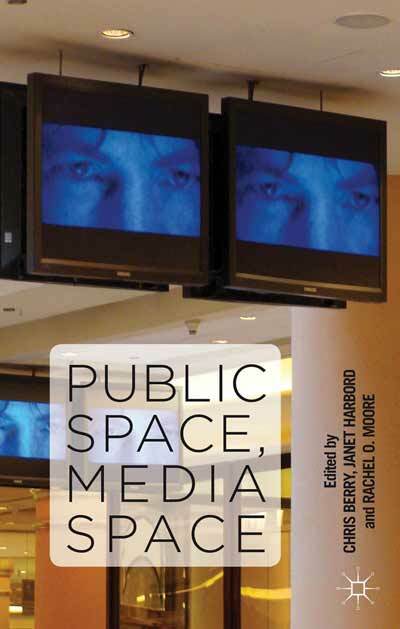 Here’s my review of Chris Berry, Janet Harbord and Rachel Moore’s edited collection, Public Space, Media Space, published in New Media & Society in November 2014. Based on a symposium held in London in 2010, this interdisciplinary collection brings together a dozen contributions on the mediation of public space. Adopting a broad definition of ‘public space’ as merely distinct from ‘domestic space’ (p. 131), the book largely avoids an engagement with public sphere theory and political participation, drawing instead upon theories of experience and embodiment to evaluate everyday media practice beyond the home (p. 3-4). Approaching both media forms and public spaces as mutually constitutive, unstable and difficult to distinguish, the book follows in the wake of similar collections (Berry, Kim & Spigel, 2010; Couldry & McCarthy, 2004) that privilege a geographically-inclined (over a political-economic) variant of media studies, which nevertheless informs a consideration of political issues. Focusing primarily on the quotidian urban experience of public space and the imbrication of media, space and event (p. 1), the book considers the relationship between “specific individual media” and “specific public spaces” (p. 2). Acknowledging the problem of defining spatial or conceptual boundaries to either public space or media space, the book proceeds to illustrate the singularity of particular objects in a variety of contexts, as well as the operation of a diversity of media within particular sites (p. 2), and to focus on the interconnectedness of cities to ‘electronic elsewheres’ (p. 8). Because this networked quality of urban space is dependent upon satellite communication technology, wireless networking not only connects public spaces horizontally to one another, but leads to the extension of public space upwards (p. 9), and, as Lisa Parks’s contribution on the mapping of satellite orbits demonstrates, to political questions on the regulation and ownership of vertical public space. Qualifying claims that the particularity of place is being erased by the “globally smooth space of flow and consumption” (p. 10), on the other hand, Mona Abaza’s account of street art in post-revolutionary Egypt reveals how the historical, political and social configurations of particular public spaces continue to determine the role of mediation. While the physical graffiti of protesters is almost immediately white-washed by the authorities, the recording of the street art on mobile phones, and its viral circulation through social media, suggests, she argues, the virtual permanence of actual public space, as well as the continued significance of local specificity to the processes of global mediation and political participation. The book also acknowledges the routine effacement of labour in the production of media goods such as iPhones. Helen Grace’s chapter on the viral internet phenomenon of the ‘iPhone Girl’, for example, gives an account of the Chinese labourer who secreted an anonymous image of herself inside one of the mobile phones she helped to produce. In producing an image of labour itself as product, personifying (if not identifying) the labourer, and defying attempts by either Apple or the iPhone owner to claim ownership of the image, the iPhone Girl, Grace argues, successfully made visible the normally invisible, and gave voice, via subsequent online discussions, to the normally voiceless experience of migrant workers. What the authors refer to as public space is to advertisers the ‘Out-of-Home’ (OOH) space – the medium through which “advertisers communicate with their customers when they’re OOH” (p. 201-202) – and several chapters towards the end of the book engage with the subjective experience of life OOH, and the ways in which the commuter’s everyday life through the urban environment is mediated, whether by public screens or their own iPods. For example, while Zlatan Krajina illustrates the ways in which commuters on the London Underground are encouraged to move straight and look around simultaneously, habitually zoning in and out of their engagement with public screens, Michael Bull’s chapter highlights the role of iPods in privatising public space by creating personalised worlds for the urban commuting subject. Interviews in other chapters with the managing director of a media agency that advises on OOH advertising, and with the director of Art on the Underground, are also enlightening for what they reveal about the distinction between private and public conceptions of the urban commuter. However, the collection is weakened by a lack of coherence to the overall selection. Although the book is ostensibly split into two types of chapter (those concerning the use of a particular medium across multiple sites, and those concerning the use of multiple media within a particular site), the two halves of the book resemble more a split between those concerning diverse examples (of both media, such as screens, social media and satellites; as well as sites, such as Shanghai, Cairo and orbital space) and those concerning, very specifically, screens on the London Underground. While there are benefits to this ‘zoom in’ approach (exploring general themes and diverse examples before looking more closely at a particular site), it does also feel like a selection of samples from what could have been two separate books or journal issues; a general collection on the mediation of global public space, and a more specialised edition on media practice on the London Underground. This weakness is probably due to the fact that the book is based on contributions to a particular London event, at which there were presumably few participants from outside London. Likewise, the fact that the vast majority of contributors are from film and media studies backgrounds may help to explain the overwhelming preoccupation throughout (both halves of the book) with screens, suggesting that an edited volume on public and private screens was perhaps originally envisaged, but ultimately frustrated by the desire to include the most outstanding (as in both the strongest and the most obviously different) chapters on satellites in orbit (Parks) and graffiti in Cairo (Abaza). That being said, there’s plenty here for those interested in examining the mediatisation and commercialisation of public space, as well as for those researching the relation between media and space more generally, or working at the disciplinary crossroads of geography and communication.